K Funk and Lady Ree (also known as individual performing artists Kristin Fung and Sheree Spencer) are the infamous singing ukulele ladies of Toronto’s TTC subway. 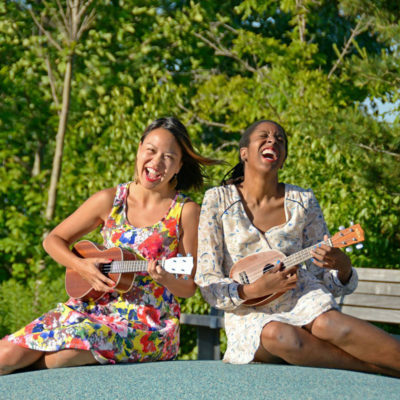 With infectious cheer and friendly acoustic sounds of the soul, the duet performs in 25 different subway stations in Toronto and has taught more than 200 people in Toronto to Bermuda ages 5 to 65 how to play the ukulele in their free workshop series, Uke Can Sing. K Funk and Lady Ree have performed for Mayor John Tory, Toronto Affordable Housing Office, Tropicana Ltd., Farm to Fork On Common Ground Festival, Living City Health, and have been featured in TV documentaries with CBC News and Rogers TV.